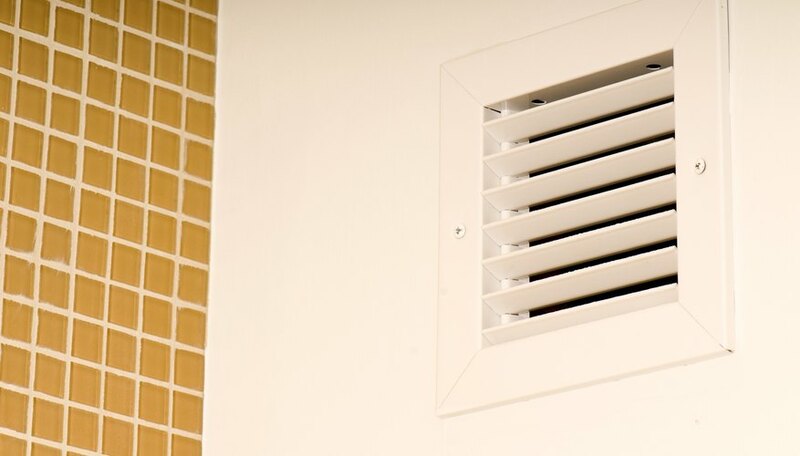 Building owners must monitor the flow through air duct grills to test how well their ventilation systems work. A pilot tube assembly, a device containing multiple probes, measures the static pressure drop between the grill’s two sides. The air flow rate through the grill is proportional to this pressure and is related to the grill’s size. If these values turn out far less than you expect them to be, this implies a fault in your system such as an unexpected break in a conduit. Hold the pilot tube assembly’s static pressure probe at a right angle to the air flow. Hold the assembly’s total pressure probe parallel to the air flow. Read the assembly’s pressure gauge, which states the static pressure drop across the grill in inches of water. Find the square root of the static pressure. For example, if the pressure drop is 1.3 inches of water: √1.3 = 1.14. Multiply this answer by the grill’s area, measured in square feet. For example, if the grill measures 2.2 square feet in area: 1.14 × 2.2 = 2.5. Multiply the result by 4,005, a conversion constant: 2.5 × 4,005 = 10,012, or just over 10,000. This is the air flow through the grill, measured in cubic feet per minute. Menezes, Ryan. "How to Calculate the Air Flow & the Static Pressure Drop Through the Grill." Sciencing, https://sciencing.com/how-11402353-calculate-air-flow-static-pressure-drop-through-grill.html. 07 August 2017.